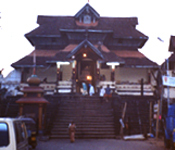 The famous Parthasarathi temple on the banks of the holy river Pamba dedicated to Lord Krishna attracts large number of devotees. The annual commemoration of the installation of the deity falls on the last day of the Onam festival. It is as part of this celebration that the aranmula boat race is held on this day. This water regatta, unlike the other boat races of Kerala, is not a contest but a retracing of a ritualistic journey undertaken to the Aranmula temple in days gone by.